This suite is exceptional, if not exclusive, and there are certainly very few places, even amongst the famous hotels of Deauville, that can rival the level of comfort and amenities provided for the room’s private use. The suite is generous in size and in terms of the organisation of its 4 spaces: bedroom – living area – bathroom – outside patio. Very open to the outdoors thanks to its windows and patio door, it will prove intimate when you draw the splendid curtains! There are times and places that require more than just words and photos. Come and visit the Deauville guest room to discover new sensations . 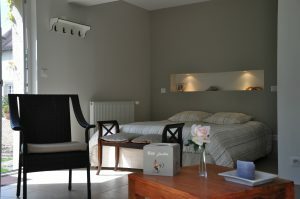 . . over and above a bed and breakfast you will be staying in the stylish Deauville! Whatever the season, and perhaps particularly in autumn and winter, you will relish the relaxing and restful experience offered here. The most difficult thing might be forcing yourselves to leave! For a romantic getaway, a “fallback base” for your marriage, wedding night, birthday celebration, surprise for your partner, or if you’re looking for total relaxation, a treat, or a spa weekend . . . there is no shortage of good excuses to come and cocoon yourselves in the Deauville suite. High quality bedding with large king size mattress (160 cm), elegant niche set into the wall at the head of the bed lit with downlights. View to the outside on 3 sides: meadow, east garden, south garden. A patio door providing access to the garden and a private patio. Patio furniture. High quality materials: “manor stone” flagstones, Marazzi “Stonehenge” floor tiles, Marazzi “Fossili” bathroom tiles. Thick curtains. A huge walk-in shower with a 59 inch (150 cm) diam. showerhead. Better than a communal jacuzzi, enjoy your chromotherapy waterair spa bath. Huge prestigious KLAFS sauna for 2 people lying down integrated into the room, with steam control and aromatic therapy. Central heating. Softened water. Separate WC and bathroom. Towel dryer in bathroom. Ventilation. Create your own wellness programme, to get rid of the week’s stress or simply to treat yourself! For certain times of year such as weekends, bank holidays and school holidays, we give priority to bookings for two nights or more depending on the case. Thank you for your understanding. Deauville no longer needs an introduction . . . and yet what a history! In a little over a century, these barren marshlands have become one of Europe’s most reputed seaside resorts. Since 1974, Deauville has hosted its yearly American film festival. With its villas, Normandy Hotel, boardwalk, beaches and more, Deauville is an unmissable “hotspot” for film buffs and stars. Deauville is also the thoroughbred horse capital of the world and its annual yearling sales are renowned worldwide. For a romantic break, a racing, golfing or cinema weekend, or if you fancy shopping; only 20 mins drive from the B&B Les Marronniers, Deauville is sure to meet all your expectations.